CJ Lang and Son Limited has been serving Scottish communities for 100 years. To celebrate this achievement, 12 months of events are planned. We've started the celebrations by branding 12 of our vehicles with centenary branding. 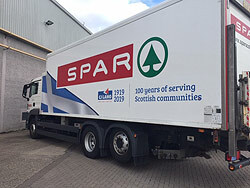 You'll see them out and about on the roads as they deliver to SPAR stores the length and breadth of Scotland. In addition to this CJ Lang and Son Limited will host a centenary tradeshow at the Fairmont Hotel in St Andrews on 28th and 29th March. Watch out for further information on centenary events in the weeks to come.